FORMING SCREW THREADS, ETC., IN THE NECKS OF GLASS BOTTLES AND SIMILAR ARTICLES.—Sarah T. Stone, of Philadelphia, Pa., adminiitratrix of the estate of Amasa Stone, deceased, has applied for an extension of the above patent. Day of hearing July 26,1869. MANUFACTURE OF ZINC WHITE.—John E. Burrows, of Newark, N. J., has petitioned for the extension of the above patent. Day of hearing, July 26, 1869. Inventions Patented in England by Americans. [Compiled from the “Journal of the Commissioners of Patents.”] PROVISIONAL PROTECTION FOB SIX MONTHS. 1,255.—APPARATUS FOE PEETENTING THE BURSTING OP STEAM BOILEES. —J. C. Cochrane, Rochester, N. Y. April 23,1869. 1,256.—PUDDLING IKON.—Charles Hewitt, Trenton, N. J. April 23,1869. 1,273.—REAPING AND MOWING MACHINE.—9. C. RidgaWay, Baltimore, Md. April 24,1869. Ij387.—REVERSIBLE PABASOL.—J. E. Banks, New York city. April 36, 1,288.—STEAM GENEEATOES AND CONSDENEBS.—B. T. Babbitt, New York city. April 26,1869. 1,291.—METHOD OP PEETENTING THE COEEOSION OF STEAM BOILEES.—G . Hawxhurst and James Pollack, San Francisco, Cal. April 26,1 6y. 1,293.—LOCKS.—.J ames Sargent, Rochester, N.Y. April 27,1869. 1,315.—RiGGlNG op SQUARE-RIGGED VESSELS.—R. B. Forbes, Boston, Mass. April 28, 1869. 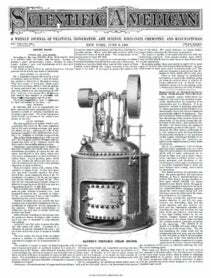 1,321.—APPAEATUS POE GEWEKATING AND CONDENSING STEAM, AND STEAM GENERATORS.—T. T. Prosser, Chicago, 111. April 28,1869.